With more than 37,000 restaurants in over 100 countries, McDonald’s (NYSE: MCD) is considered an American icon around the world. Even more impressive is the stock’s history. Investing $2,250 for 100 shares in McDonald's IPO in 1965 would have left you approximately $10 million richer. Though the company has faced multiple challenges on its way to dominance, the fast food chain has continued delivering impressive results through the decades. It is also a Dividend Aristocrat meaning it belongs in the exclusive club of companies which have paid and increased dividends for at least 25 consecutive years. In point of fact, its record of increasing dividends stands from 1977, representing 40 years of aristocratic status. For Q1’17, analysts were expecting EPS of $1.33 on revenues of $5.5 billion whereas the company outperformed market expectations and delivered EPS of $1.47 on $5.68 billion of revenues. EPS rose by 19.4% on a YOY basis. 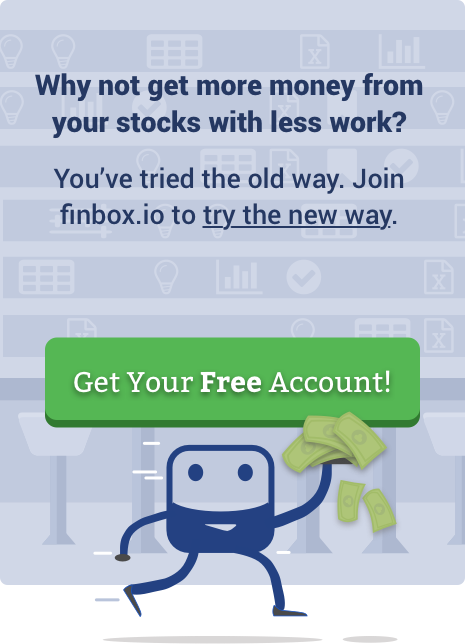 The better than expected Q1 earnings, large stock buybacks and the allure of the ever increasing dividend has made it an investor favorite once again. And as a result, McDonald's stock has catapulted higher. MCD’s stock was trading at around $120 to start 2017 and in less than 6 months, shares have risen by over 25%. 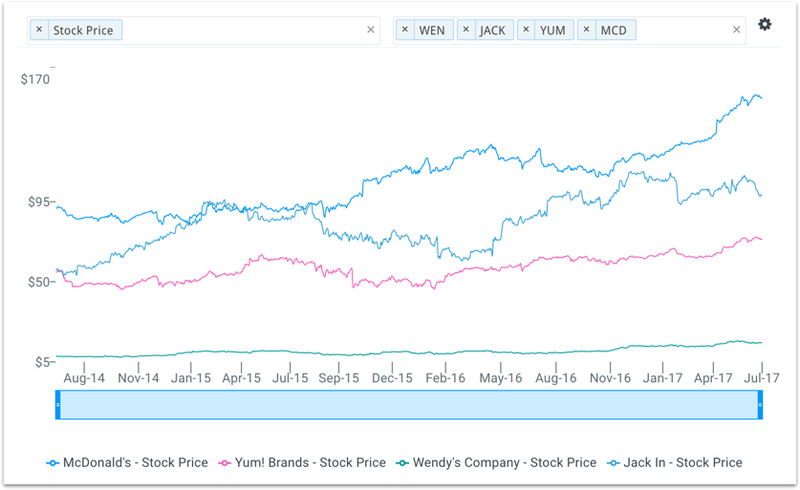 During the same period, the majority of its competitors have been unable to keep up; Jack in the Box (NYSE: JACK) -13%, Wendy’s (NYSE: WEN) +14% and Yum’s Brand (NYSE: YUM) +14%. However, Restaurant Brands International (NYSE:QSR) has also been impressive increasing 30% over the same period. Same-store sales growth (SSSG) measures the increase in a company’s revenues from its existing chain of restaurants. It is ultimately determined by a combination of the total ticket or meal size and foot traffic in the restaurant. 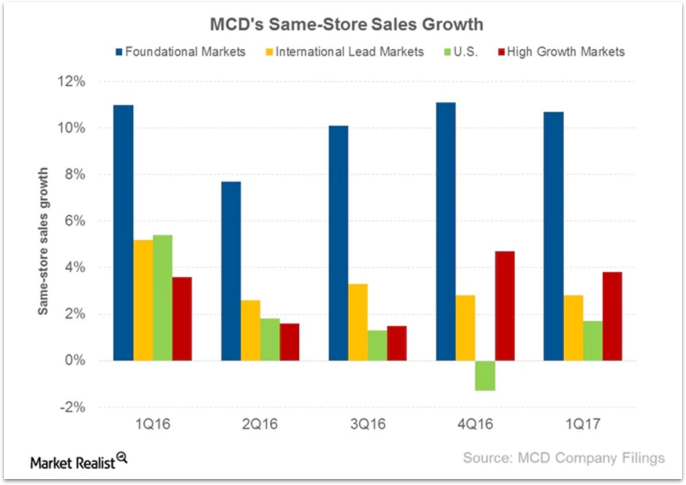 It’s important to use this metric to analyze McDonald’s as opposed to simply revenue growth because the company is transitioning into a franchised store model. In 2012, 19% of McDonald’s restaurants were company-owned and 81% were franchisee-owned. This has since shifted to 15% owned vs 85% franchisee-owned as of 2016, respectively. As a result of this refranchising effort, overall revenue has declined but overall margins and profitability has increased. In Q1’17, McDonald’s posted SSSG of 4% which beat analyst expectations of 1%. An inspiring development, the food chain registered positive SSSG growth in all its markets (U.S., International Lead Market, High Growth Market, and Foundation) partly due to aggressive marketing and its Experience Of The Future (EOTF) initiative. The company has started introducing self-order kiosks and tablets in seating areas to enhance the overall customer experience. McDonald's is expected to post revenues of $22.4 billion for fiscal year end 2017 which would represent a fall of 8.9% from the $24.6 billion in fiscal year 2016. As previously noted, converting company-owned stores into franchise stores will reduce total sales but will also lighten its asset base and reduce operating costs. Going forward, the fast food giant is planning to refranchise 3,500 restaurants by the end of 2017 and 4,000 more by the end of 2018. Wall Street believes this will help McDonald's EBITDA and EBITDA margin reach $10 billion and 50%, respectively, by fiscal year 2018. This is well above the $9.3 billion in EBITDA and 37.6% margin achieved in fiscal year 2016. Furthermore, the company has been concentrating on three areas to drive its SSSG; digital, delivery and EOTF. Under the EOTF project, the company is introducing various tablets in restaurants that will help customers bypass long queues at the cash counter as well let them customize their own orders. By the end of 2017, McDonald's also plans to start its mobile order and pay system in 20,000 restaurants across the world (4,000 of which will be in the US). By 2020, the company plans to convert all of its traditional restaurants to EOTF restaurants. These initiatives will surely resonate well with investors on the heels of Panera's (Nasdaq:PNRA) successful implementation of a similar strategy. However, investors should not expect a similar buyout while the market values McDonald's total equity at over $120 billion. 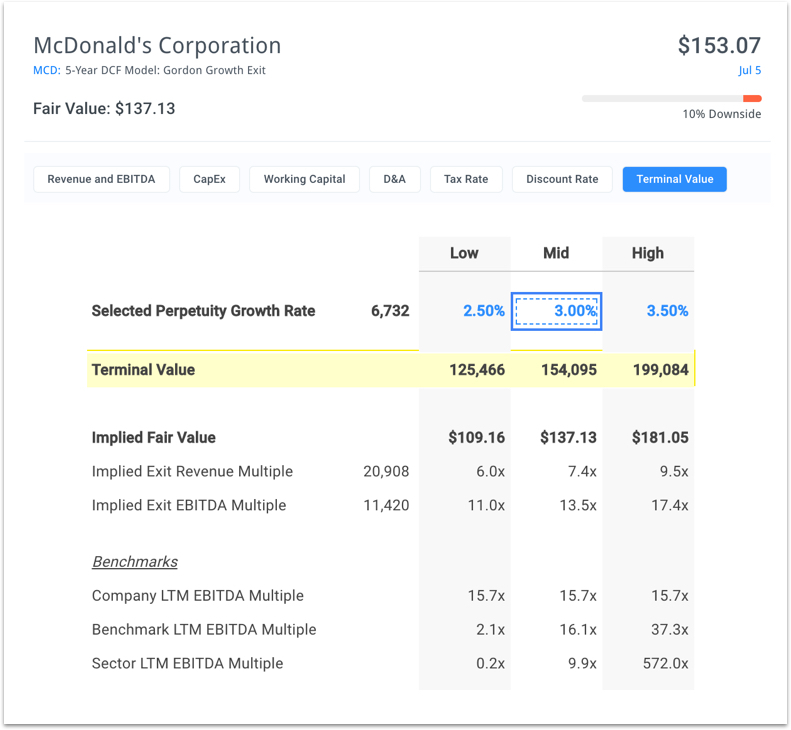 Assuming McDonald's can achieve +50% EBITDA margins beginning in 2018 and sustain a 3% SSSG into perpetuity, finbox.io's 5-year DCF analysis calculates fair value of approximately $137 per share. 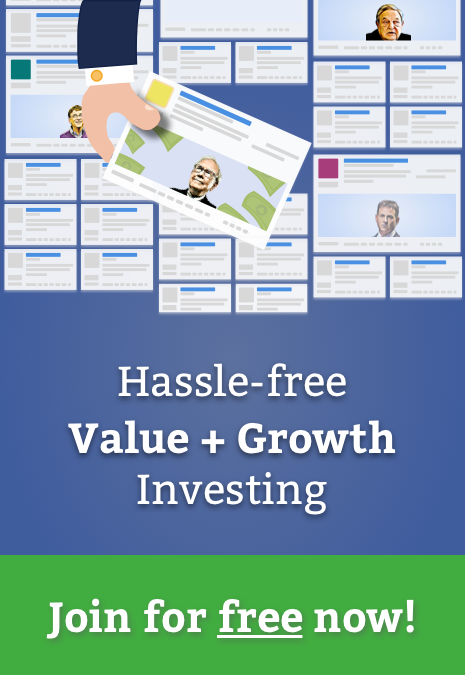 These aggressive assumptions imply that the stock is currently 10% overvalued. The EBITDA exit multiple of 13.5x (at the midpoint) implied from the analysis below is telling and requires further examination. Credit Suisse recently raised its target price to $165 for MCD highlighting that "McDonald’s trades in line or at a discount to most of its franchise peers." Yes, the company's 15.7x EBITDA multiple trades below its benchmark average of 16.1x. However, this may not be the greatest comparison. 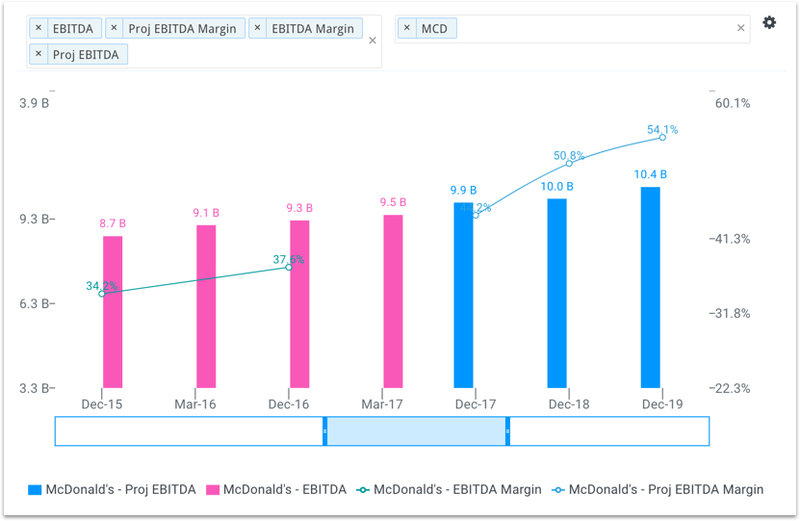 According to CapitalIQ, McDonald's EBITDA multiple has average 11.0x since 1994 (furthest the data goes back), 11.1x over the last 10 years, 11.9x over the last 5 years and 13.9x over the last year. While McDonald's multiple might be trading at a slight discount to its peers, it is trading at a large premium to its historical average. The EBITDA exit multiple of 13.5x implied in the DCF analysis seems reasonable as it is above historical averages but below the current multiple. Furthermore, the last time McDonald's EBITDA multiple traded at over 15.0x was in late 1999 when the stock was just above $45 per share. By mid September 2000, the stock dropped 38% to $28 per share. Don't expect McDonald's stock to drop nearly 40% within the next year but value investors may want to wait for some pull back before buying. The fast food retail giant is making positive strides to becoming relevant again but there is simply too much risk priced into the current share price.